At last an evening with decent transparency promised a productive session. However the price for transparency often seems to be poor seeing and last night proved no exception. I commenced by trying for M 67 & NGC 2903 but the guiding was very erratic due to the seeing and results disappointing. It was 11pm before the atmosphere began to settle and I was able to obtain some better subs for M 81 which gave a more satisfying result than the earlier subjects. 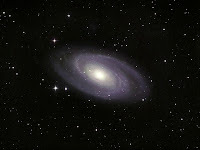 M 81 is about at the northerly limit my present situation allows me to image. Details: 10" f4.3 Newt. 5x 8 minute + 7x 10 minute exposures @ iso800 with CLS in DSS, CS2 @ XAT. Pete. Brilliant! This is my favourite of all your images (so far) It's at least as good as anything foming from the big names.Great Stuff!! Thanks for the really nice comment John.... Unlike others it seemed to process well without much effort.